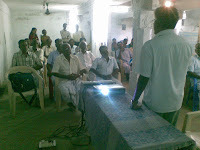 Following the successful meet organized for women over forty on the 13th feb 2010, Sugam Charity organized the second meet for gents over the age of forty years. 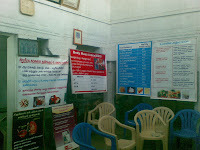 The aim of the meeting was to spread the awareness of life style diseases which are rife in this age group. The format of the meet is to give awareness talk to spread the knowledge and to provide an individual assessment of these people. This is different to the master health check up though one part of it is based on the master health check up as described below. Master Health Check up is now given as a standard to most corporate employees as part of their corporate social responsibility. The corporate bodies also take up this role to ensure they have healthy employees who in turn will take less sick leave and increase their productivity. However this type of check up is not given to the people in the villages, one due to the lack of model of someone giving them the option of health check up as corporate bodies. but it is mainly due to the lack of awareness. sporadically the Sons and Daughters who are working in cities bring their kith and kin for these health check up, however the common man misses out. This type of health check up can bring up the problems, hopefully at an earlier stage so that the treatment can be effective. It would also ensure people with risk factors are advised accordingly so that life style diseases do not affect them in the future. The second part of this activity is where the charity wants to concentrate. Spreading the awareness by giving them not only their health information but also with an interactive forum at their doorstep. This has been made very much possible by the talks given by the doctors and more importantly by the Nursing School Principal of KMC, Trichy and her Team. We at Sugam Charity cannot thank them enough as they do this on a sunday when most of us would rather spend relaxing at home. We also thank the Management of the KMC and KMC speciality hospitals for allowing us to use their team the education materials for this public exercise activity. We at Sugam Charity hope that we have done some good to these people, only time can tell us so.